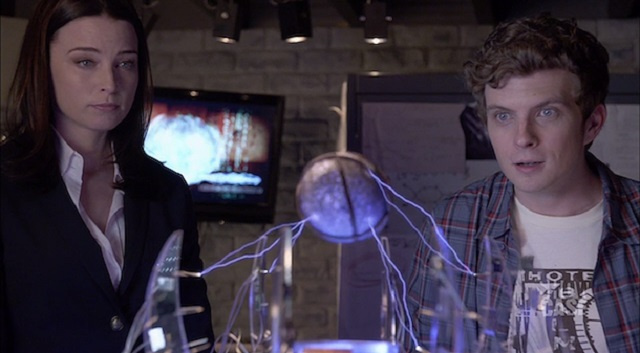 Fruitless Pursuits: Continuum Seasons 1 & 2 Reviewed! Those of us who love science fiction television often have to wait a long time between drinks for another show to come along and fill the void that the previous ones, who have either been wrapped up or cancelled, have left behind. Fringe, Eureka and Sanctuary are gone and have left a whopping hole in my science fiction viewing. 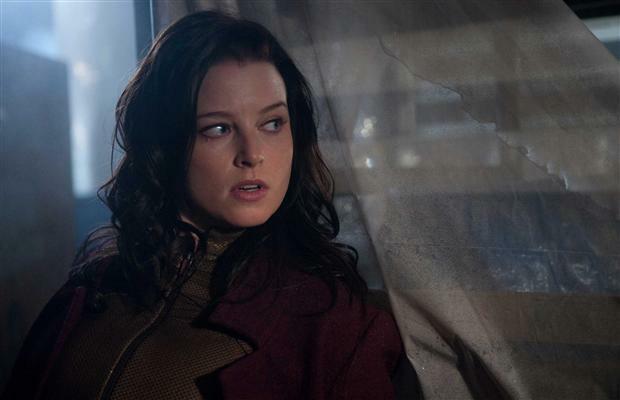 Enter Continuum; a science fiction drama headed up by Rachel Nichols that's taking an interesting approach to science, terrorism and technology. The year is 2077 and Kiera Cameron is a new age policewoman called a Protector. She's a mother, a wife and a professional arse-kicker. In 2077 there is no government, everything is controlled by the biggest corporations of the day. Technological advances have made it much easier to monitor and record people for their safety, upgrade them when they require it and as it turns out, bend them to the will of the corporations. When a group known as Liber8 rise up to take power back from the corporations they are branded as terrorists and their war efforts escalate. Many are killed but the lines are blurred as to who or what is truly responsible for these atrocities. During a planned execution of a group of high-ranking Liber8 members, they use a device to travel back in time and change the past in order to win a war of the future. Kiera, one of the officers overseeing the execution, is sucked into the blast and transported back to the year 2012. She is desperate to stop Liber8 and return home to the world that she loves. 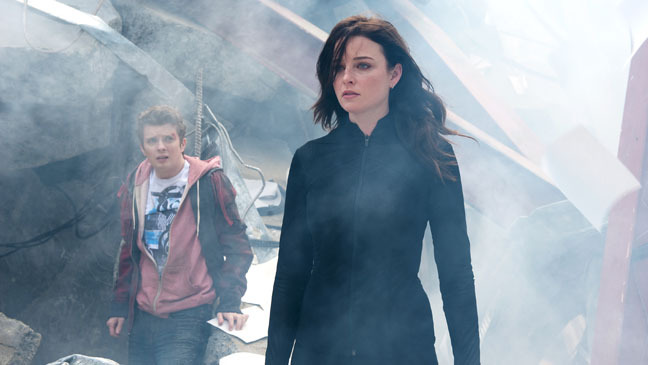 Continuum has been compared positively to Life on Mars, which I recently reviewed here. So if you liked that show and are interested in Continuum, then follow me under the cut for a look at it's first two seasons and what makes it a really solid science fiction show. Continuum is commenting on something very reflective of our time; looking at technology and who is in control of that technology as well as the power and role of politics. Increasingly, technology is used to better our productivity, performance and life style. As we become able to connect more freely, to control what we see and how we access information, we are also open to social isolation, health issues that arise from a less active lifestyle and the consideration of what would happen if control of that technology fell into the wrong hands. And just who would the right hands have been? Kiera Cameron, our hero, is sent back to 2012 and quickly learns about the political turmoil of our time, although she cannot see how the future isn't as bright as she believes it to be. See, the interesting thing about Continuum is that our central character starts out believing that the future she comes from is great, and that the corporations were right to take over. She also believes that Liber8 are nothing more than a bunch of terrorists, who have no point other than murder and destruction. What she slowly begins to realise, and truly what she had continually been suppressing on many occasions before, is that the corporations and the world she lived in had its own problems and its own pitfalls. Implanting cops with technology might be great for civil law and order and for catching criminals but it also invades privacy and can give information to people who would use it to unfairly control a populace. Not to mention the unethical use of the technology to create super soldiers or blackmail people and keep them in constant debt to serve as slaves to the system. In addition, because the corporations control this technology and information, there can never be anything like a peaceful demonstration against their power; those who disagree are either forced into submission or to resort to violent and criminal attacks. It illustrates just how lucky we are to live in a democratic society with a democratically elected government. The questions that the show poses about our present situation and our future are not only powerful but illustrate the power that science fiction has always had in encouraging us to think about the world in which we live and the choices we make. Kiera herself is a complex and multi-faceted character. As a mother she is devoted to her son Sam and would do anything to protect him, but that doesn't mean that she has a charmed life or family. Increasingly it becomes clear that her husband isn't everything she had hoped for and her sister had gotten caught up in a bad part of the system. Kiera is strong willed, skilled and intelligent but her future, her training and her use of her CMR (computer chip in her head) have all made her a different kind of functional human being. Her level of compassion and social understanding is very different to that of the humans in our time. It's really nice to see a female lead character that has strength as well as vulnerability and femininity; she isn’t pigeonholed or stereotyped. It is also refreshing that this show has her partner with a male police officer and there is nothing other than friendship involved. Kiera and Carlos build a friendship around trust, dedication to their jobs and uncovering the truth. Kiera also doesn't always make the best decisions, which make her human and fallible, and the perfect vehicle for the audience to begin to understand the stakes, issues and the history of this world. 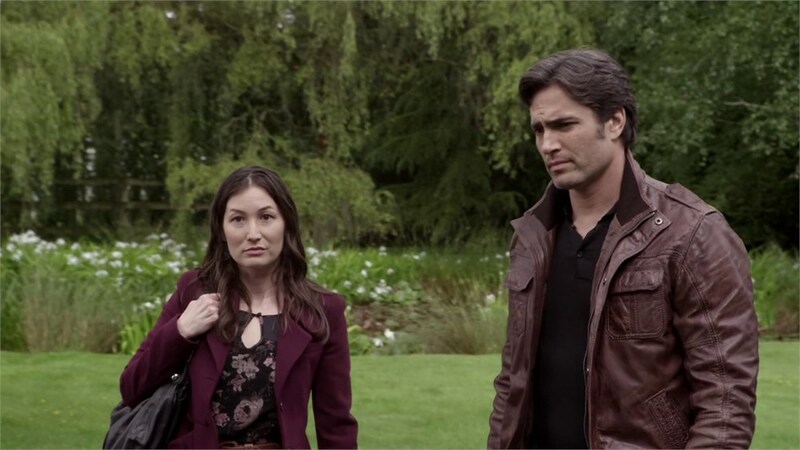 Alec Sadler is really the other central character of Continuum; a boy genius who goes on to create the technology that informs the future that Kiera is from. Young and impressionable now, Kiera develops a strong bond with him as she tries to understand why she was sent back and what she can do to get back to the future she left behind. As it turns out, these might be contradictory things if her purpose is to actually change the future she came from and realise that things aren't what they should be. Can she sacrifice the things that she personally holds dear to save so many other people? And what is Alec's role in all of this? How is his future self different to the young man we are positioned to care about and sympathise with? The Liber8 terrorists are from all different walks of life, many are soldiers or mercenaries, but they also include civilian followers and information technology specialists or scientists that have joined the cause after learning that their findings are being used against people. Their ideology is only fraught 50% of the time, if that, which makes for interesting viewing as we see these characters explore concepts of freedom and the rights of humanity versus murdering innocent people in order to achieve their goals. 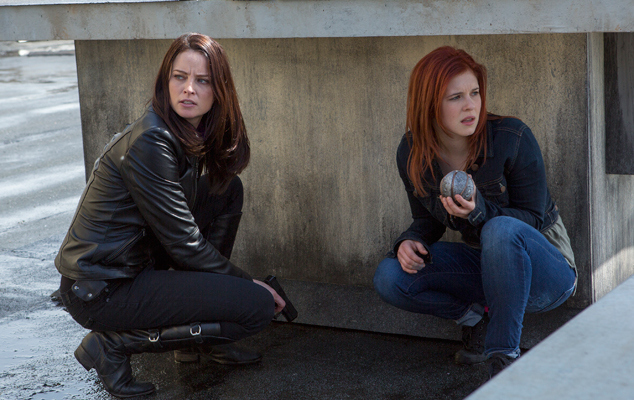 Ultimately, you should watch Continuum... but if you want more spoilers or have already seen it then continue below! Season one sets up a lot of the context for the show, increasingly indicating that maybe this perfect and wonderful techno future that Kiera comes from and seems to believe in aren't really all that great. We learn that back in her future her husband cheated on her and she was very conflicted about the things that she saw while on duty and the technology being used. We learn that her sister was addicted to a drug that came from the technological advances and killed herself. We also find out that Alec Sadler more or less sent Kiera back to 2012 as he has encrypted a message in her suit (a high tech gadget) for his past self; warning of the potential repercussions of his actions. It's difficult to tell whether the future Alec is a bad bloke or what is going on. Kiera continually tries to bring the Liber8 group to justice while avoiding detection from the FBI and her partner Carlos who is getting increasingly suspicious. If that isn't bad enough a Special Agent Gardiner from CSIS is sent to follow her and question her about whether or not she is actually working with Liber8. It is also revealed that the FBI IT whiz Betty is working with Liber8 and the town Mayoral candidate is using their services to get elected. Matthew Kellog, a previous Liber8 member, is now working for himself and trying to make a life in 2012 given that he has privileged knowledge and can make a lot of money. He occasionally works with Kiera to get information or to thwart Liber8, however, Liber8 try to blackmail him into swapping his grandmother for Kiera's - the idea being that if his or her grandmother were killed then they would cease to exist. Kellog's grandmother is killed and Kellog does not disappear leading to more conjecture about the nature of their appearance in 2012 and what may or may not be part of established events. A lot to take in? It doesn't stop there. As it turns out, Alec's half brother Julian is actually the predecessor of the Liber8 leader Kagame. Julian is initially spurred on by his father’s belief that the corporations are going to lead to the undoing of the government of the people. Protests turn violent and Julian's father is killed while Carlos is wounded. Julian is sent right into the hands of Kagame and convinced to blow up a building; however at the last minute it is revealed that Julian was a decoy and Kagame is the real suicide bomber. Agent Gardiner sees Kiera use her suit to protect herself and Alec from the blast and to disappear which only inflames his suspicion that she is not who she says she is. As season two progresses we learn more about the mysterious Escher who has been covering for Kiera by occasionally calling the FBI and saying that he is her authorising officer. He is potentially a freelancer and is certainly part of whatever establishment of the future is based in 2012. It has become clear that there are more than just the people who came through with Kiera living in 2012 from the future. Kiera meets her partner from the future who was sent through in the same blast as her but arrived close to a lifetime ago. She meets Jason, an eccentric who claims to be from the future and yet has lost his mind. She also encounters freelancing agents from the future who attack people to get technology or information relevant to their end game and/or to stop people from discovering the truth about those who are from the future. This is how Agent Gardiner is ultimately killed, right when he and Kiera start cooperating. Kiera also tells Carlos the truth about everything; where she is from, who Alec is, what her technology can do and what she is doing here in 2012. Carlos takes this all pretty well and continues to work with her. It's great that they have done this because having her trying to give him the slip or keep lying to him unconvincingly was getting very old. Now Carlos can be part of the team! Alec is employed by Kellog to create all of the technology that he was going to create in the future anyway, while Alec falls in love with a girl called Emily. Emily is actually working for Escher to protect Alec from the terrorists and also to steal his technology and give it to Escher. Things get complicated when she starts to develop true feelings for Alec. Meanwhile, Julian's real story comes out as the man who inspired Kagame rebel and create Liber8. Julian has started out small, winning his case of being an alleged suicide bomber and then joining the Theseus Group who have been established in his name. He is potentially responsible for Lucas going mad, but given the fact that Jason also went mad this could be due to the side effects of time travel. Kiera worries what effect this might have on her. When Emily reveals that she has actually been working for Escher and that she did not destroy a piece of dangerous technology on Alec's behalf but gave it to Escher (as well as being sent to retrieve the time travel device which she knows nothing about) things escalate. For a start, the newly reunited Sonya and Travis get Kellog's help to break into the lab and take back the Protector suit that Alec is working on and have Travis' CMR activated. Of course Travis actually wants to use this to kill Kiera, not to go after Escher as Kellog thought. Alec and Emily, upon escaping with the time travel device, hide in Jason's house. It turns out Jason is actually Alec's dad. When the Freelancers come for the device a battle ensues which results in Emily throwing the device away from the group in an attempt to distance the Freelancers from them. Instead of protecting Emily, Kiera leaps off after the device and Emily is killed. Kiera retrieves the device in a moment of complete selfishness where she sacrifices a person’s life and her friendship with Alec for a way home. There were earlier discussions about destroying the device as it has only caused harm thus far and Kiera didn't look like she was up for that either. This is where Kiera turns into a bit of an anti-hero. Alec is finally seen walking into Escher's office and not answering Kiera's calls. The season two finale is amazing; it pieces together various seemingly unrelated scenes from various episodes and explains what is actually going on and what role each person is actually playing. 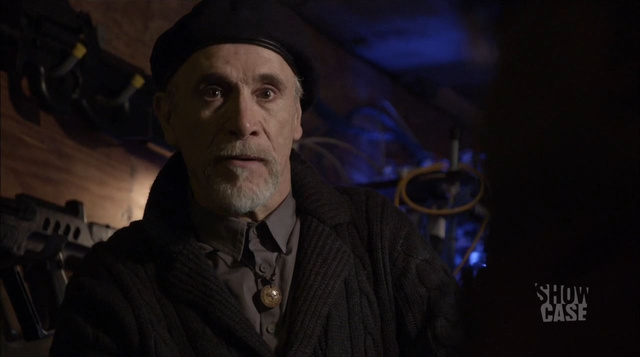 Alec goes to Escher and discovers Escher is actually his father. Jason is in fact Alec’s son from the future who was sent back by accident enacting Alec’s plan to send Liber8 back with Kiera. A Freelancer was with Jason at the time that he was transported and the Freelancers in 2013 are trying to round up all of those people hanging around from the future, working actively against what Alec was trying to achieve. Kiera is brought in for questioning and Carlos helps her to escape. Carlos figures out that Betty is the mole in the FBI and enlists her help in setting Kiera free as well as taking her with him when he leaves. In the final scenes of the episode we see that he has gone to Julian and his mother to help their cause (HOLY CRAP!!!). Alec tells Kiera into bring him the time travel device so he can send her back and stop everything that has happened from happening. Kellog decides that he wants to come with Kiera because his life isn’t completely working out for him in this time stream. Kiera has an epic battle with Travis and leaves him for dead before both herself and Kellog make their way to Alec. 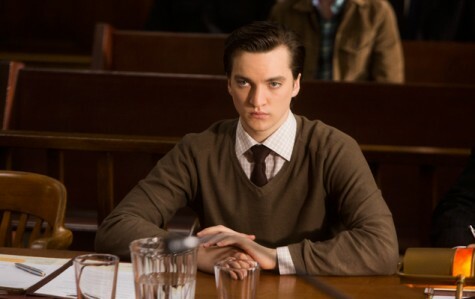 Alec reveals that telling Kiera she was going home was the only way to get the device back and that Escher is his father. As the Freelancers arrive he uses the device to transport himself back in time to save Emily. This part of the storyline is slightly problematic as Emily and Alec didn’t have a lot of realistic chemistry on screen and though they kept saying they were in love, it was rarely believable. That Alec would go and try to save her is a bit sketchy as a result but I guess we have to believe that he was so in love with her that this is a likely course of action. At the end of the episode Kiera is shown drugged and hauled into a transparent cell, a scene that was played in a previous episode with the audience assuming that this is an event from the future timeline. It is not the future that we were anticipating. It is our present. 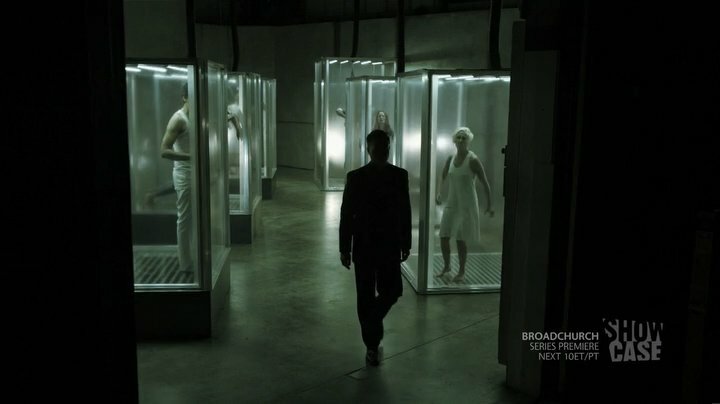 Kiera is locked in this transparent cell and sees Travis’ limp body suspended in a cell in front of hers, next to her are Garza and Kellog and we see that Sonya and Jason are also captured; all of the people from the future. It becomes clear that the Freelancer agenda is to clean up the interference of time travellers. This is why Escher faked his death and removed himself from Alec’s life. Curtis Chen is shown at the end, not just a figment of Lucas’ Imagination but well and truly alive and operating as a Freelancer. This was revealed a few episodes before in seemingly unrelated circumstances, however given that Kiera had killed Curtis sometime before it seemed unlikely that Curtis himself would have anything to do with the overall story. The Freelancers were shown in the second last episode to have some kind of restorative function whereby they come back to life after dying so this actually makes sense. As the Freelancer’s survey their work they comment that the timeline is no longer under threat… except for Alec Sandler who has gone further back in time, but they reflect that this is not their problem, another team will take care of that. What does this mean for next season? Will we be switching between multiple time streams or will we focus only on Alec’s new time stream? How will this affect the ultimate plan and the ultimate future? All I know is that I cannot wait for Continuum to start again. Wow. One of your favourite of all time?!?! That is big endorsement! I think it is really genuinely solid storytelling and season two was awesome. Just of this past year, let's not get *too* ahead of ourselves, haha.